Yes, you have found it! The app that will locate places to play pinball - WORLDWIDE! 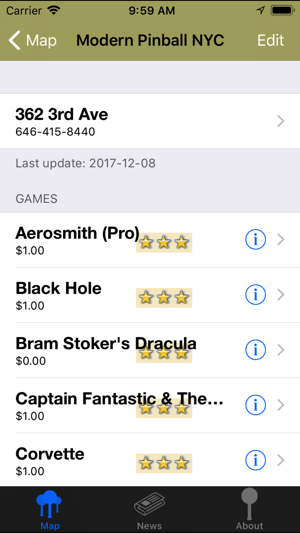 Just open the app and tap "Find"; you will be presented with a map of your current location, and the nearest pinball venues nearby! 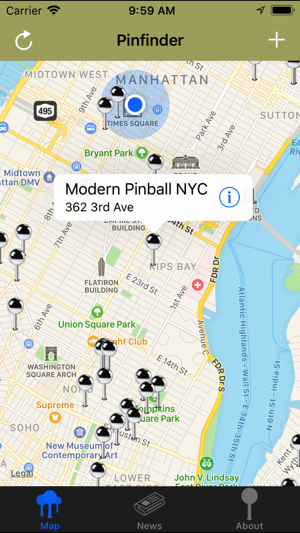 Tap a location to see what pinball machines are there! Price of the machine and condition is viewable. Tap on the "rules" button to see rules for any game! You may also add new locations and update games using the app! 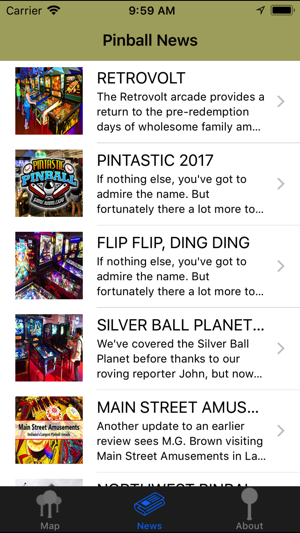 The fine art of pinball is experiencing a renaissance lately, so get in on the action with this app! Head on out to your local bar, arcade or gameroom and support this fun sport! Visit www.pinballfinder.org for more info. Please submit comments and suggestions to app@pinballfinder.org! Very outdated. Would be better if the information was not 2 years old. I'm a pinball addict and everyone knows these awesome machines are like finding unicorns nowadays. My friend told me about this app so I downloaded it immediately and found a place 5 minutes from my office that has 8 tables. My lunch hour just got a whole lot more fun! !